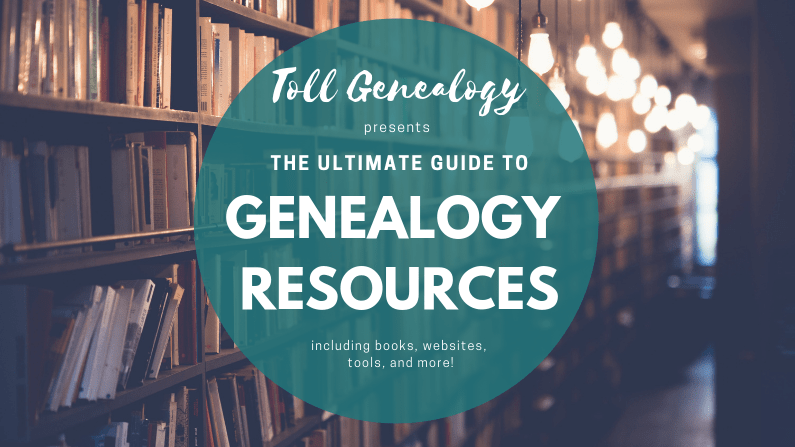 Welcome to Toll Genealogy’s Genealogy and Genetic Genealogy Resources page! This page features the best genealogy resources I am aware of including books, software, commercial websites, dna analysis tools, and my favourite genealogy websites and bloggers. To jump to a specific section, use the links below. Where possible/relevant I’ve included a note about the book/link as to why I recommend it. If you would like to suggest anything to appear on this page, do drop me a line! Disclosure: The vast majority of links on this page are affiliate links, including all Amazon links and many of the genealogy/DNA test company links. Such links help support this site. If you’d rather not do that, Google (as always!) is your friend. Also note, the Amazon links will show as UK but should direct you to your local Amazon site for those of you in the US or Canada. These mostly focus on British records but there are a few special interest titles and American publications. Although these are all Amazon (affiliate) links, needless to say, you can check your local library to see if they have them available, or do utilise the Kindle preview feature or ‘Look Inside’ to get a feel for whether a particular book will suit you. This is a great introductory book; it’s big but easy to read. It was originally designed to accompany the British television series. With this it would be a while before you’d need to delve more in-depth! A much smaller book than the previous one, and more recently published. This will give you the key overhead view. A great book for the genealogist who wants to become a bit more organised and professional in their research, and is a recommended text for both the IHGS Correspondence Course in Genealogy, and the University of Strathclyde postgraduate certificate in genealogy. A great overview of the records available for more recent British genealogy. You probably don’t need to buy this one if you bought the WDYTYA encyclopedia, but if you want a smaller book, this is a great one. This book is a detailed guide to British census records, taking each one in turn discussing background, what information can be found, problems with that record-set, and how to use that particular census most effectively. I wish I had had this book when I was starting out with my research. Another great in-depth book covering the UK censuses. You probably do not need both census books so take a look at previews for both and see which one you think you will like better. Another book focusing on pre-1837 records, very much in-depth, for those who want to delve deep. This is also a recommended text for a number of genealogy courses. A great guide to methods and sources available for tracing British ancestor prior to the introduction of civil records in 1837. And at time of writing is exceedingly cheap on the Kindle (UK) store! At first glance you might think ‘why would I need this’. I did. But it was a recommended text for a course I’m doing, so I had to buy it. I’m so glad I did. It doesn’t just cover civil and parish records, but every single other (British related) recordset that you might need, including non-conformist records, Britains born overseas records, Channel Islands, and the Isle of Man, as well as military records. If your British ancestors are struggling to reveal themselves or you know they travelled, do take a look at this book. I was recommended this book years ago and consider it my bible for Scottish Genealogy – this latest edition is even more comprehensive than the original version I had. Irish ancestors can be difficult to trace. This book, another set text for the University of Strathclyde postgraduate certificate in genealogy, has just arrived with me, and oh my I wish I had discovered it earlier. It’s incredibly comprehensive, but also brilliantly laid out, and has separate sections for each county, plus information for working out which county you should be looking in. This book is basically the bible when it comes to church records. First published in 1946, and still going strong! This is the third edition. I adore this book. If you’ve ever wanted to write up your research into a family history record for the rest of your family, for posterity, or even to publish, this is a great guide on how to do so if you find the idea a bit overwhelming, or if you’ve never attempted this kind of writing. Also currently very bargainous at the UK Kindle Store! In full disclosure, I do not own this book. However, I am recommending it to those researching US genealogy as it is the companion book to the US version of Who Do You Think You Are. The author is very well known in the professional genealogy field, has great credentials, and looking at the Kindle preview, I’m confident that it is a great beginner book. This book came out towards the end of 2018, and is aimed at US genealogists and those looking to uncover US ancestors. It is really comprehensive but still accessible. This would be my number one recommendation for US newbie genealogists. This is an American book, but relevant to genealogists everywhere. As the title indicates, it goes into detail about making sure your research is as correct as it possibly can be. This is the best genealogy notebook I’ve found. If you are the kind of person who wants to keep paper records, this book has 127 ancestor data sheets that are well designed and other helpful templates, including a full index for the data sheets to fill in as you go. Also, most importantly for such a notebook, the paper quality is really good. My one complaint about this book is it isn’t spiral bound. If I were going to use it I would probably do that. Disclaimer, I haven’t read this, because I have never got along with Evernote. However, a lot of people swear by it for genealogy, so I did want to include this book for those of you interested in understanding the best way to use it. This slot originally had the ‘Genealogy Do-Over by Thomas MacEntee, but it appears to not be in Kindle anymore, unfortunately. I’ve therefore switched it out for this book, which also deals with organising your genealogy. But! I haven’t read it, the content seem kind of general, and reviews are mixed, so I’m going to get a copy to review. Last but not least, this book by Amy Johnson Crow is a 31 day easy to follow course in genealogy whether you are an absolute beginner or coming back to it after a break. Amy has a very popular blog (linked below!) and newsletter, and her writing style is really clear and enjoyable to read. A great first book on genetic genealogy. I would start here. As the name implies, this book is a much more hands-on practical book, I’d suggest looking at this after either Blaine’s first book, or the Tamar Weinberg book. Frustratingly, it appears to no longer be available in hard copy. Although the title implies this is just for adoptees, in truth, it’s great for all, but does have extra resources aimed at adoptees and also includes some interesting case studies. This is a slightly older book than the others I’ve recommended, but still has a lot of good information in, and provides a thorough grounding in genetic genealogy. Including this because I discovered this series late last year and really enjoyed it! Below you can find links to each testing company. Rather buy on Amazon if you are shopping there anyway? No problem, you’ll find links for the tests currently available via Amazon directly below that. Following are links to the DNA third-party tools and websites I use most often. Don’t forget Facebook either – there are groups for almost all these tools there which have a wealth of information! 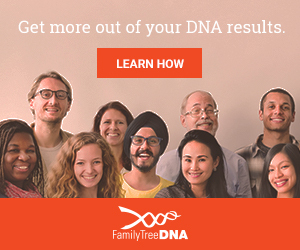 Genetic Affairs which automates the retrieval of new DNA matches for you at Ancestry, 23andMe, and FamilyTreeDNA, and emails you the new results. It also has an auto-clustering tool. There are currently a few teething problems with Ancestry, but otherwise, it’s a great tool, and you can try it for free without providing a credit card number. Rootsfinder is general genealogy website with a tree builder function, but they recently announced some new DNA tools which are currently in Beta. For more information, see here: https://www.rootsfinder.com/blog/announcing-experimental-dna-tools/. Jonny Perl’s DNA Painter is a brilliant tool whereby you can ‘paint’ your DNA using data from sites that have a chromosome browser. The idea is, you paint the DNA you share with other people, and as you discover your common ancestors, you know which bits of your DNA came from which ancestor. Cool, huh? Housed at the DNA Painter website, use this tool to quickly get a sense of how far back your common ancestors with a particular match are likely to be. This tool, also housed at the DNA Painter website helps you work out how you might be related to a group of DNA matches who descend from the same common ancestor. In full disclosure, I do not really use Family Tree Software. I do own both FamilyTreeMaker and MacFamilyTree, but I use Ancestry pretty much exclusively, and I export my trees as gedcoms periodically as a backup. Therefore the links below are included as those which I’m aware have the best customer reviews. Because I can’t personally recommend, note none of the links in this section are affiliate links, because, well, that would be weird! These are some sites I really try and keep up to date with reading, and whose posts I really enjoy. Some are better known than others, but all are great to read. Note these are not in any specific order, though I did try to list the genetic genealogy sites first! Glossary should be live in a few weeks time! Family Tree Webinars mentioned below also has some fantastic webinars relating to genetic genealogy. The University of Strathclyde also run a couple of short courses relating to genealogy, but I can’t give you any insight into these as I haven’t done them (for no greater reason than they are costly and the material covered seemed too basic for my knowledge level). This is a fantastic beginner level course provided by the University of Strathclyde (but via the Future Learn website), and even better it’s completely free! It runs often, so don’t worry if you have missed the start date. I highly, and I mean highly, recommend this if you are looking for a beginner level course. Regular free webinars on a variety of genealogy subjects, plus you can access any past webinar via a yearly or monthly subscription. For details of upcoming webinars, see https://familytreewebinars.com/upcoming-webinars.php.